Today was the first day of Kyoto Art and Antiques’ semi-annual antique sale in the Georgetown neighborhood. Although we like to see the interesting Asian wares whenever it’s open, we’re not serious antique shoppers, so we don’t make an effort to go on the first day. (Last September I made my first major purchase there.) We happened to be in the area today though, so we stopped in – and it was packed! We should have known that all the serious antique shoppers would mob the place as soon as it opened. Needless to say, the crowds made sketching difficult. 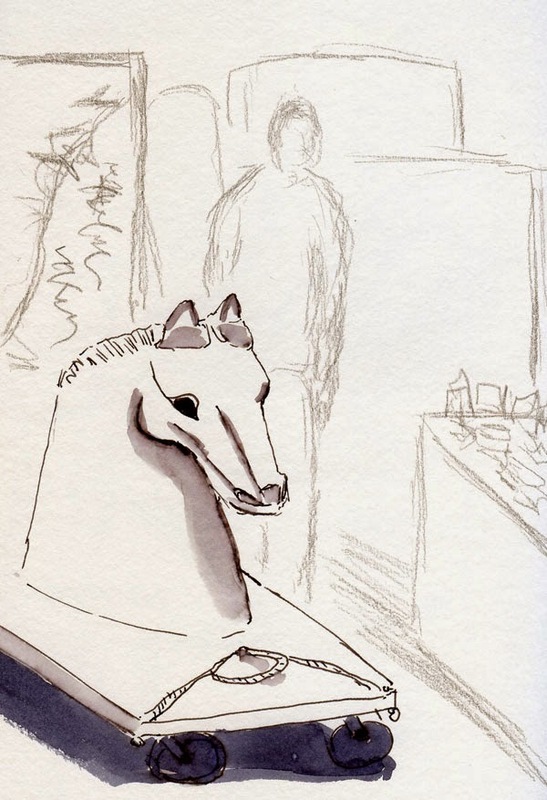 I spotted this large stone horse and wedged myself against the side of a cabinet to sketch it without getting bumped. Behind the horse was a screen with a lovely bamboo pattern and some Japanese calligraphy. I had roughed it in quickly along with other things in the background. At that point, Greg came by, so I chatted with him for less than a minute. When I looked back again, someone had purchased the screen and taken it away! 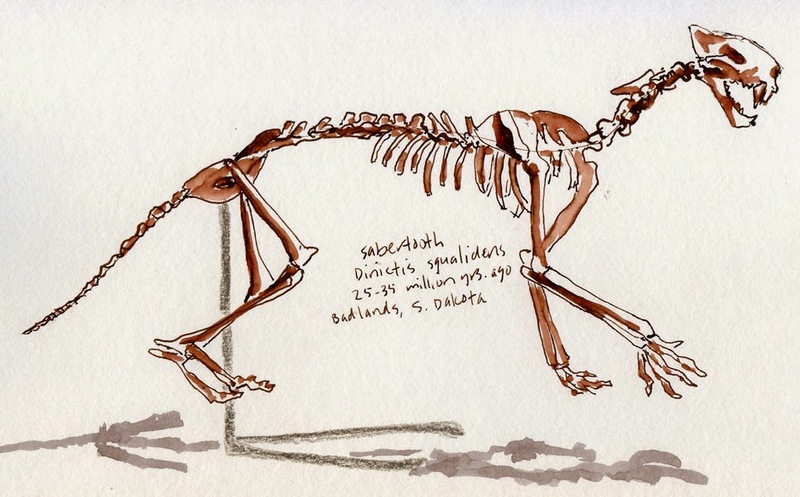 I guess you have to be quick to sketch at an antique show. Unlike wood cut prints or the fine hatch marks of some of the other masters we’ve been copying, Van Gogh’s lines are more organic and irregular – a huge bonus for me in this week’s class. Although copying his drawings is just as labor-intensive and time-consuming as the previous assignments, I find it somewhat easier to make his curvy line strokes rather than straight ones. It is fascinating to study the originals and see the wide variety of strokes he used to convey light/dark or foreground/distance. 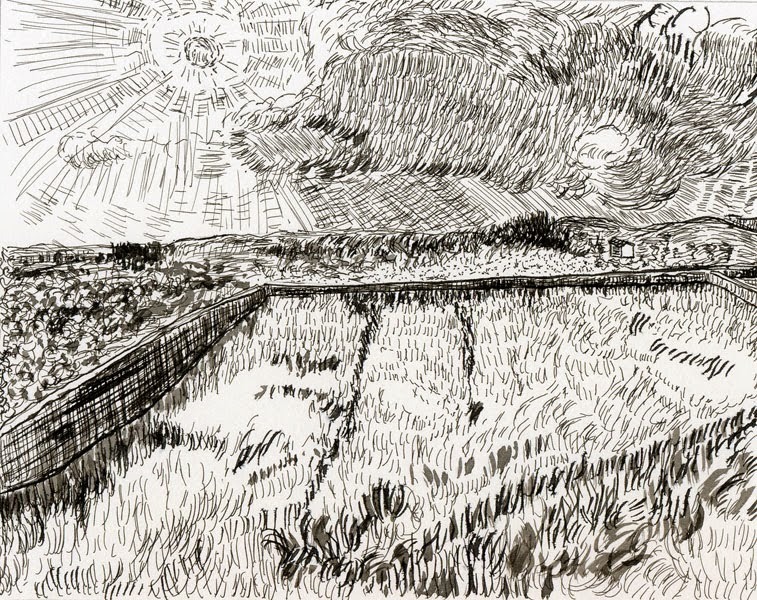 As my classmates and I silently scratched away with our dip pens trying to emulate the master, our instructor Eric Elliott read a bit to us from a book containing a large collection of Van Gogh’s drawings. 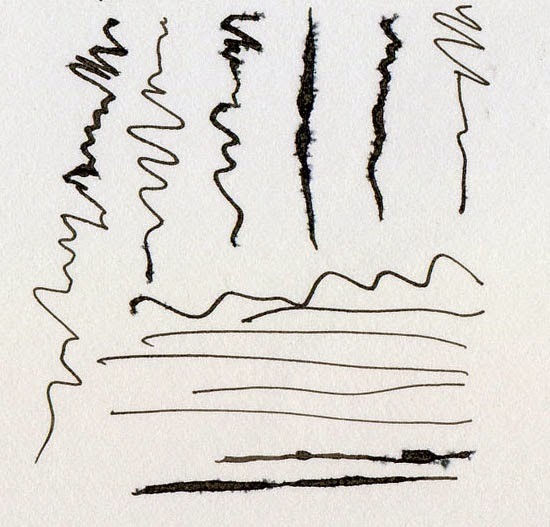 Apparently Van Gogh used a reed quill – essentially a finer version of the twig I use when I emulate KK! 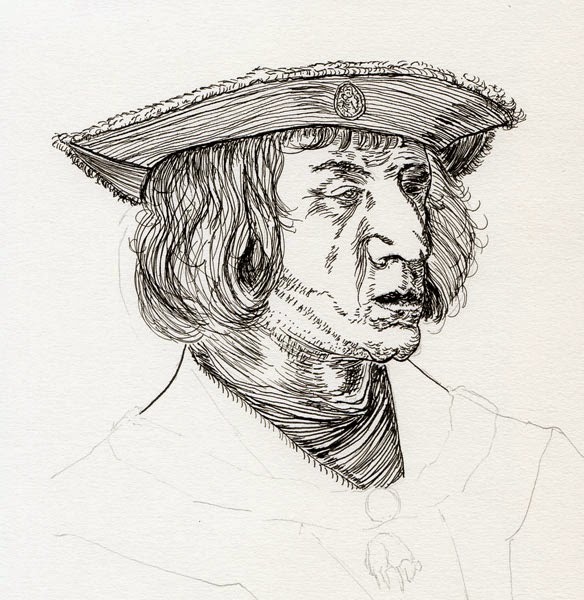 – to do his drawings, which makes me appreciate his drawings all the more; he probably had to re-dip his reed with every stroke (unlike my delightful Zebra Comic G nib, which holds a fair amount of ink per dip). 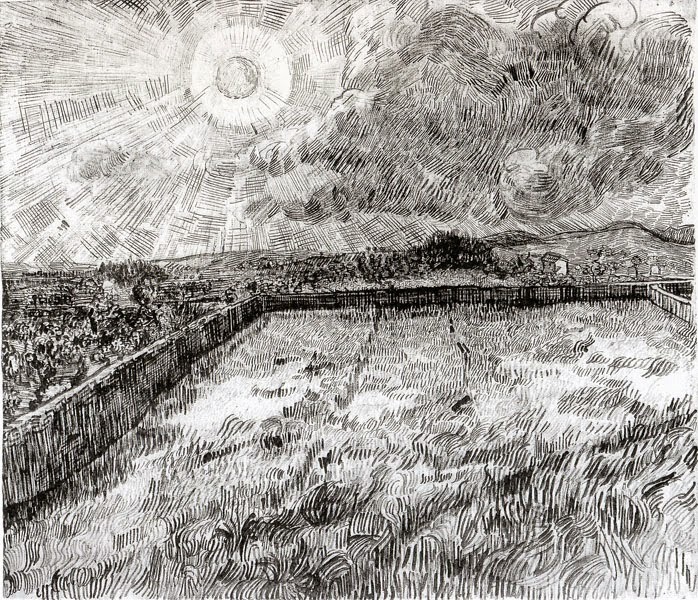 I haven’t studied Van Gogh much, so I was surprised to see how many drawings he had produced (as opposed to paintings). When I said this to Eric, he told me that Van Gogh had periods when he made drawings because he couldn’t afford paint. I thought about how easily I place an order at JetPens.com or DickBlick.com whenever I “need” an art supply (or just feel like I want something new), and it broke my heart. P.S. 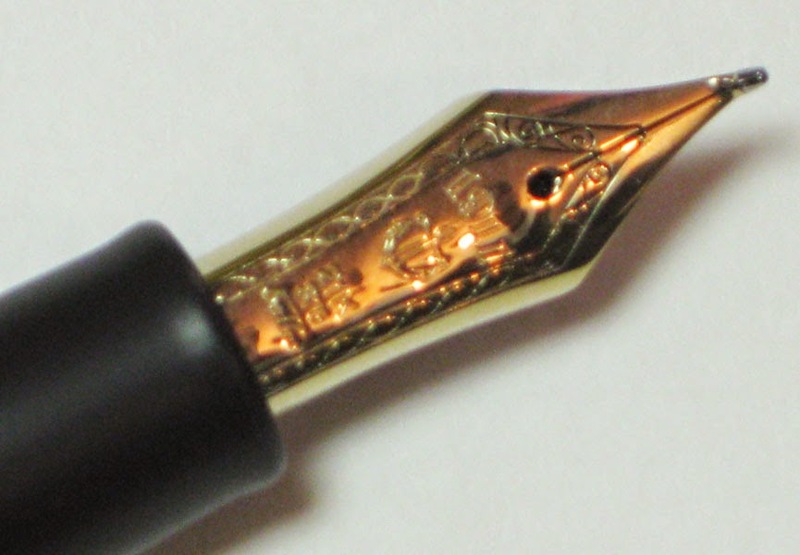 Speaking of JetPens, I just got a Tachikawa nib holder for my G nib, and it’s terrific! The rubbery grip makes it so much easier and more comfortable to hold for long periods, hatching away. I’d give one to Vincent if I could. 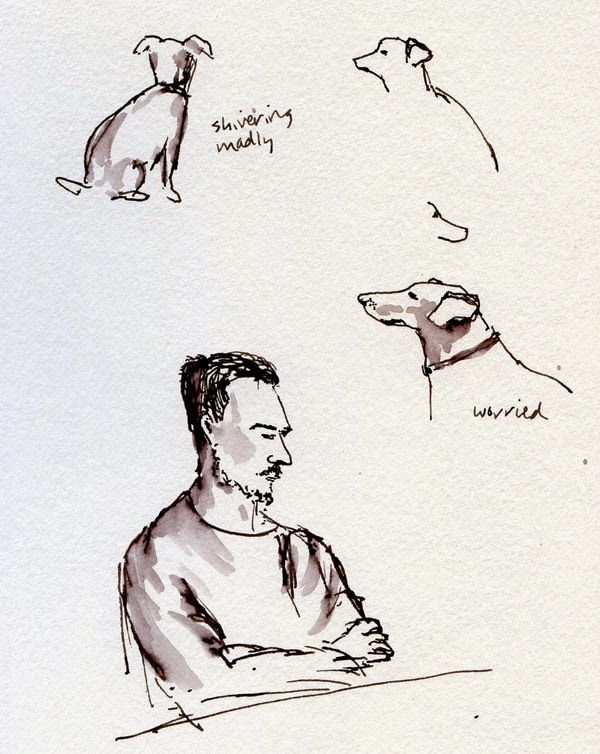 Today’s lesson at Zoka Coffee was squirminess, both human and canine. 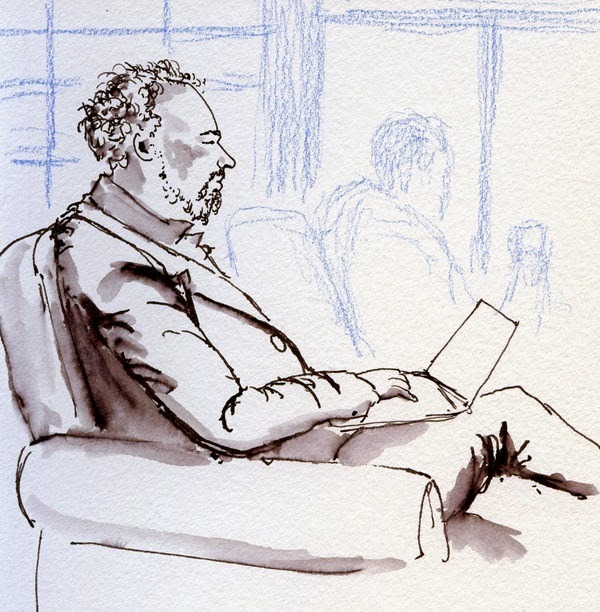 I find the three-quarter view of a person’s head – less of the face showing than a profile (the man facing left, below) – is one of the most difficult angles to sketch. Outside the window where I was seated is a bike rack where people like to tie up their dogs while they dash in for coffee. Dogs waiting for their humans – in these cases a shivering Chihuahua and a part-Dalmatian, I think – always have such worried expressions, staring in the direction that their person went, or nervously glancing from side to side, until the expressions turn to pure relief when their humans return, after all. Have you ever heard a car being described as feeling like part of one’s body? My car is narrow, short and very low to the ground, so when I make a turn, I feel attached to the vehicle as it moves. (In Greg’s much larger, higher car, I feel my body lurch through the turn like an afterthought – definitely not attached.) This morning, its first time at Zoka, my new pen became part of my body. 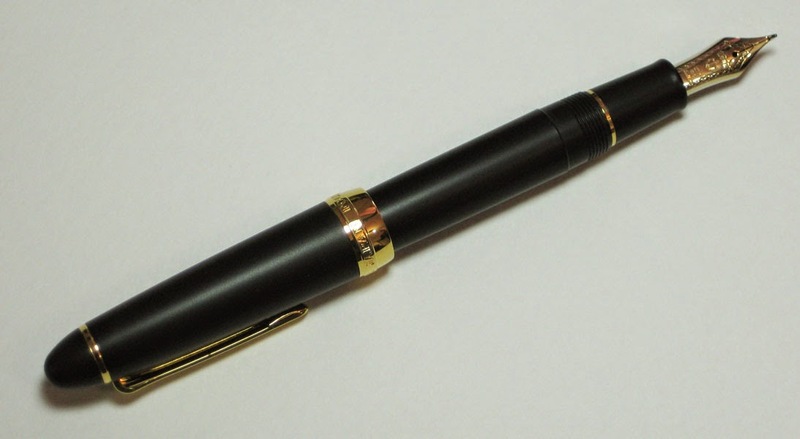 I know it’s just a pen and not an appendage, but unlike other pens I use, this one feels like it’s attached. It probably doesn’t show in my sketches, but my lines feel more fluid. In my recent post about drawing with water-soluble inks when using watercolors, I had mentioned spraying the sketchbook page with water. Larry asked about that, so I thought I’d respond with this post about the watercolor part of my sketch process. I have a good selection of “real” watercolor brushes (as opposed to waterbrushes) – some synthetics plus a few sables, including my favorite Escoda travel brushes. I use them only when I’m home. For example, any still life that I’ve done at home was painted with one of those “real” brushes. You may have noticed that the colors are more intense and more carefully applied in those still lifes compared to sketches done on location. Those sable brushes are a joy to use, and I’m sure my urban sketches would improve if I took them out in the field with me. I realized a long time ago, however, that if I choose to use “real” brushes on location, a layer of complexity is added to my process that I know will keep me from doing some sketches that I want to do. For example, in places like the middle of a shopping mall or during the 10 minutes before my bus comes, I either can’t use a stool because I’d be blocking others, there’s no place to set down my paints and water cup, or I don’t have time to fill a cup with water. I could choose to draw on the spot and paint later, but I know myself well enough to know that once the moment is over, so is my inclination to continue the sketch. So I either remain standing and use my clip-on watercolor box, or I take advantage of the bus shelter bench and make a 10-minute sketch. In either case, if I’d had to use a sable brush with a cup of water, I probably would have decided not to sketch. But here’s where the philosophy comes in: I don’t want to let those moments get away because I’m hindered by my materials. So I’m content with the lowly waterbrush, and that’s the only brush I use on location. Page spritzed with water before applying watercolor with waterbrush. Now the answer to the sprayed-water question: As anyone who uses a waterbrush knows, those crappy nylon bristles are OK for small areas but are absolutely terrible for washes of any size. So when I want to paint a streak of blue to indicate a sky, I use a basic wet-on-wet approach to compensate for the waterbrush. First I spritz the paper with a small atomizer (intended for perfume) that I also use to wet the tube paints. 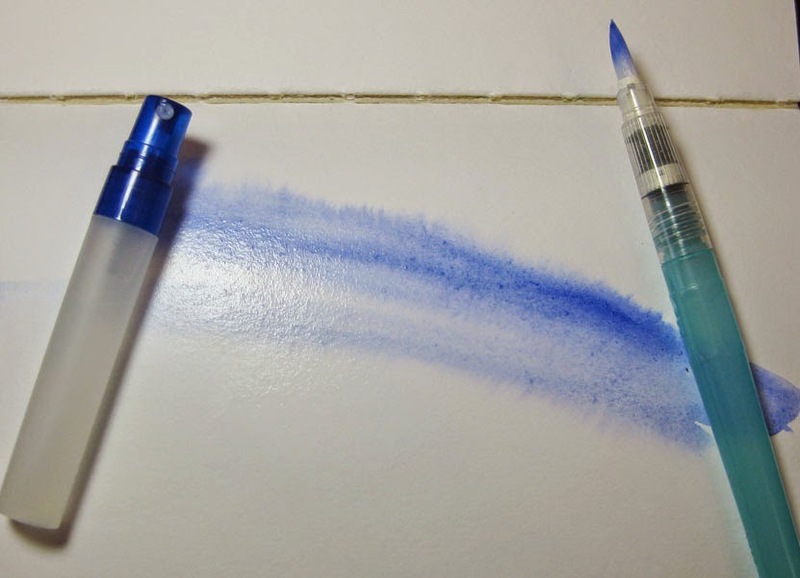 Then I use a clean brush (ironically, that’s when I use one of my travel Escoda brushes – because I know it’s always clean) to smear the water around more evenly. And then I use the waterbrush to give it a quick swipe of paint. The wet surface helps spread the paint more broadly. OK, so it’s not a Shari Blaukopf or Tom Hoffmann sky! But it gets the job done a little better than the waterbrush alone. And more to the point: It fits my philosophy and lifestyle. 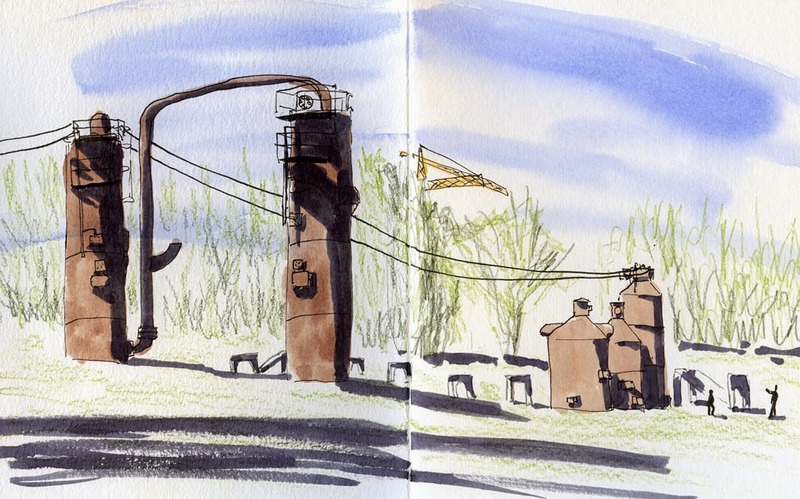 The last time I sketched at Gas Works Park, it was last August (August! The one month of the year in these parts when you think you can count on sun) with the Friday sketchers, and it poured most of the morning. Today it felt like a different world. For one, Kite Hill is closed for soil work, so only the area around the Gas Works was accessible, and I couldn’t climb up the hill for the wider view that I was hoping to sketch. But with the sunshine, blue sky and 75 degrees, I’m not complaining about a thing. 4/25/15 Sailor Doyou and other water-soluble inks, watercolor, Caran d'Ache Museum water-soluble colored pencils, Canson XL 140 lb. 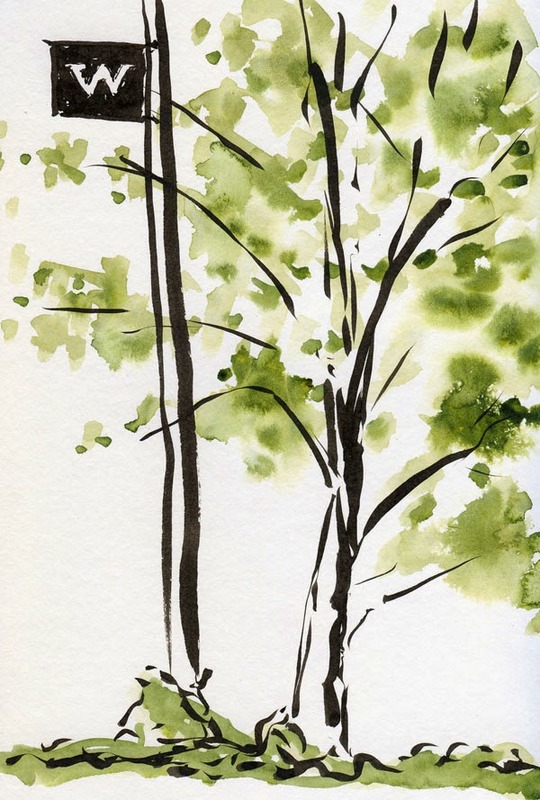 Today’s sketch (above) is an experiment I’m going to try more often: Instead of using waterproof ink, I drew the outlines of these trees and branches with water-soluble Sailor Doyou ink. I had to remember to save the power lines till the very end, or they would have blurred away when I sprayed the page with water, but otherwise, my process wasn’t very different from when I draw first with waterproof ink. I really like the way the tree branches diffused with the sprayed water and watercolor application. In the case of these particular trees, which had pale brownish-green foliage, cool, dark gray Doyou makes a good complement. The ink probably would have muddied the paint if I’d used a bright yellow-green. 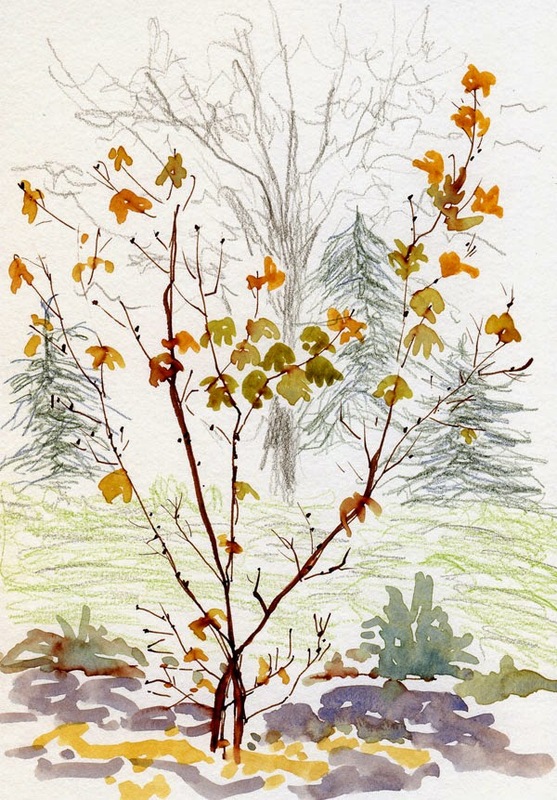 The last time I remember doing a similar experiment was last October, when I used my long-time favorite Diamine Chocolate Brown ink with watercolors to sketch turning maple trees (at right and below). Chocolate Brown is much warmer than Doyou, so it coordinated well with orange and red leaves. I think using water-soluble inks works best with organic subject matter that is conducive to a softer, blurry look. It’s harder to pull off with objects that require hard edges, like buildings (although I’ve certainly seen sketches of architecture done by an artist in this way to stunning effect; I wish I could remember who that was). I’m not trying to avoid waterproof inks altogether, as there are many times when I really want clean, sharp lines and distinct colors. But sometimes it’s fun to let the edges go soft and fuzzy. In addition, there’s a physical (chemical?) reason why I often reach for my pens containing water-soluble inks (containing dyes) instead of the one with waterproof ink (containing pigment): The former are almost always “wetter” than the latter, and I always prefer the easier flow of those wetter inks, which seem to make me draw more loosely. 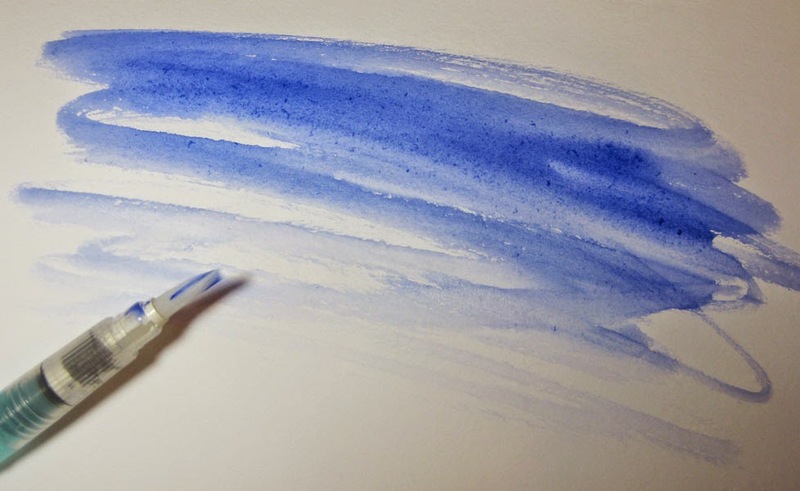 Interestingly, Liz Steel has recently been blogging about using waterproof inks to draw into watercolor while it is still wet, making the ink lines blur a bit before they dry permanently. It’s a different way to get a similar effect. Do you ever have one of those days when every sketch you attempt should have just stayed in bed? 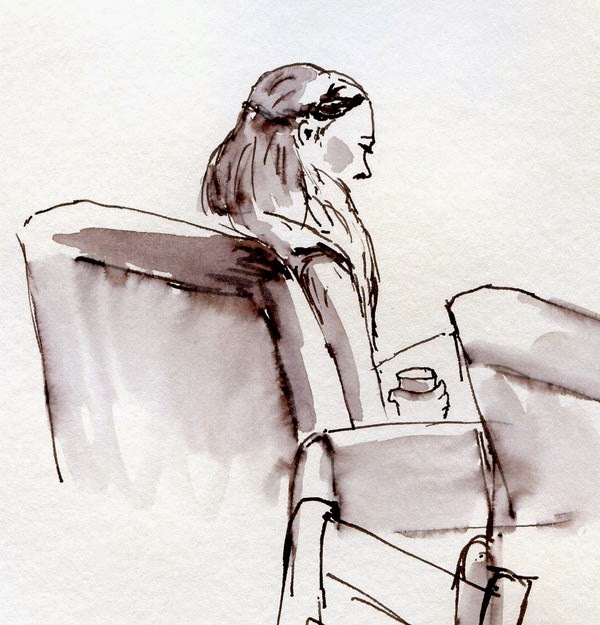 A small group of Friday sketchers gathered at Suzzallo Library on the University of Washington campus on this blustery, spitting morning. I usually find something inspiring to sketch on campus, but that tends to happen more often when I sketch outdoors. A year ago an even smaller group met there, and while my sketches inside the library were less than inspired, my last sketch outside made the trip worthwhile. 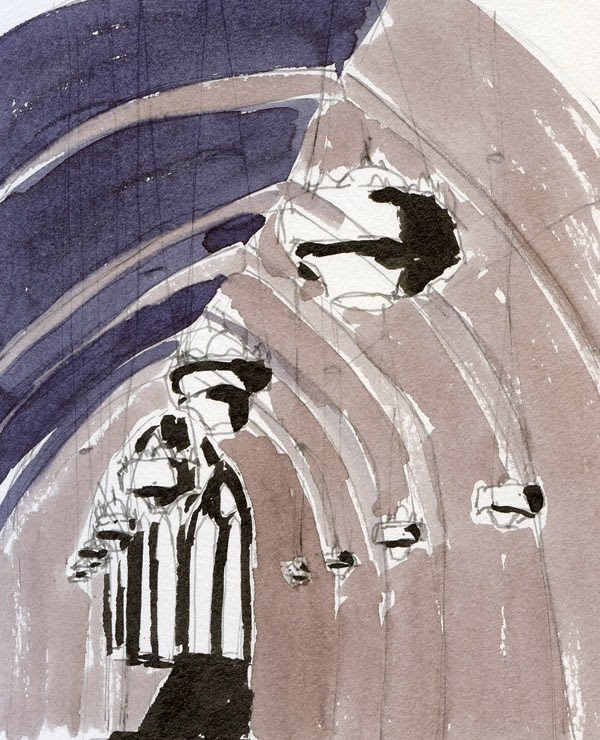 Today I had déjà vu of last year’s debacle when I began in Suzzallo’s quiet study room, a cathedral of gothic arches. It was meant to be a simple value study that went terribly wrong. Next I ventured over to the far end of the attached Allen library, which was new territory for me. I found plenty of large windows offering what could have been inspiring views. I picked the entryway of the HUB where a small information fair was going on. Ho-hum. Eventually I wandered over to the HUB, where I have memories of many, many mediocre meals consumed in a rush between undergraduate classes back in the late ‘70s. Unrecognizable to me now, it looks more like an airport food court than a student union building. 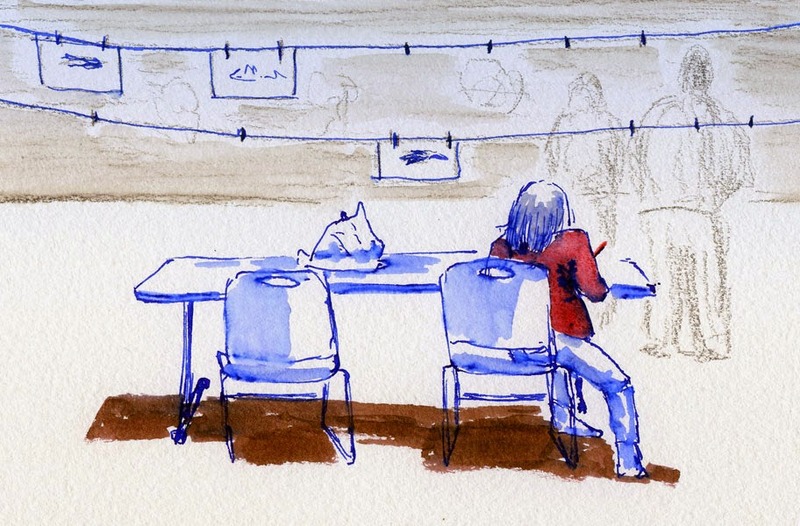 Times may have changed, along with the wall paint and food vendors, but one thing hasn’t: Students still wolf their food down during short breaks between classes, taking far less time to eat than I could take to sketch them. After our meetup to share sketches, I realized I had just missed a bus, so I sat at the shelter to wait for the next one. Those last 10 minutes on campus turned out to be my best: a tree and a lamp post bearing the U of Washington banner. 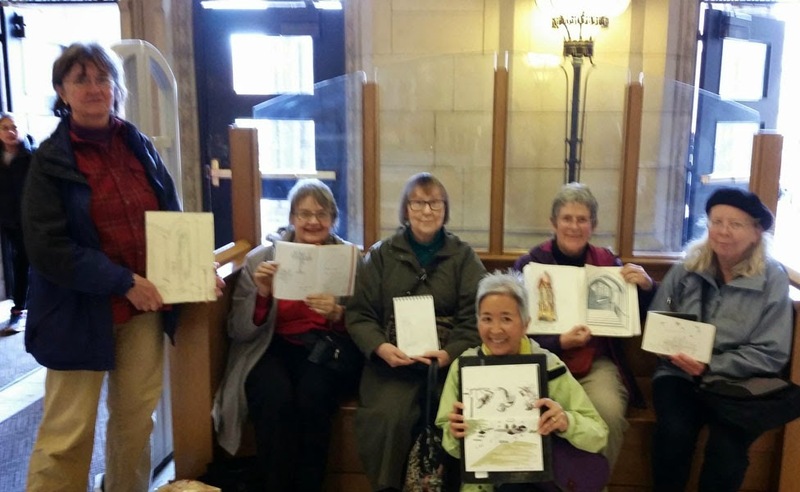 Gwen, Nancy, Anne, Peggy, Alex and me at Suzzallo Library. 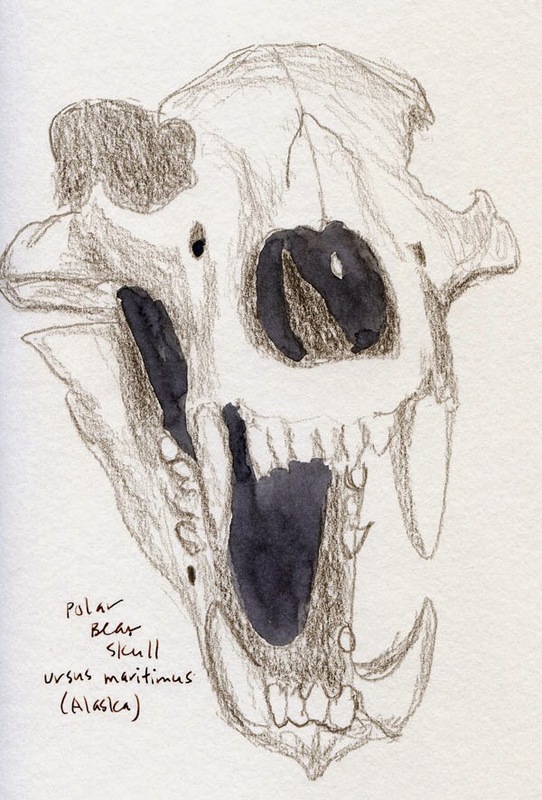 Edited 4/25/15: Per Matthew's suggestion, I cropped one sketch (below). I agree that it's better! Thanks, Matthew! Remember the TV series “Heroes” from a few years back? It was about otherwise ordinary people who possessed various superpowers. Some abilities were of the typical comic-book variety, like flying, shapeshifting or invisibility. Some superpowers were just plain silly, like the guy who could melt toasters. Others were more useful in the contemporary world, like the little boy who could communicate directly with ATMs and computers (wouldn’t that be a useful superpower to have!). If I could choose my superpower, there’s no doubt which one I would pick: the ability to not feel weather conditions. 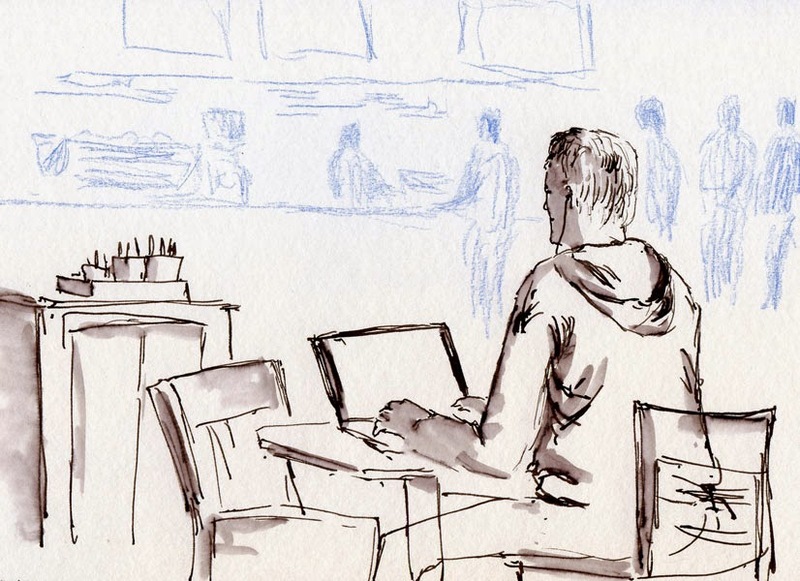 I could sketch outdoors in the middle of a sub-zero blizzard or in the blistering hot desert and feel as comfortable as I would in my 68-degree, climate-controlled home. 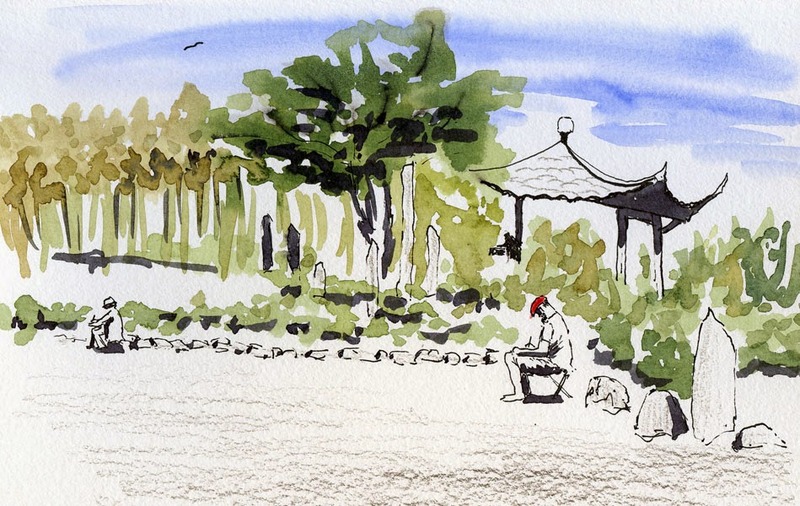 (Or, for that matter, on a perfect spring day like last Sunday at the Chinese Garden.) My skin would repel rain, wind would swirl away from me, and the sun would never burn. That superpower would allow me to sketch anywhere in the world, in any season. 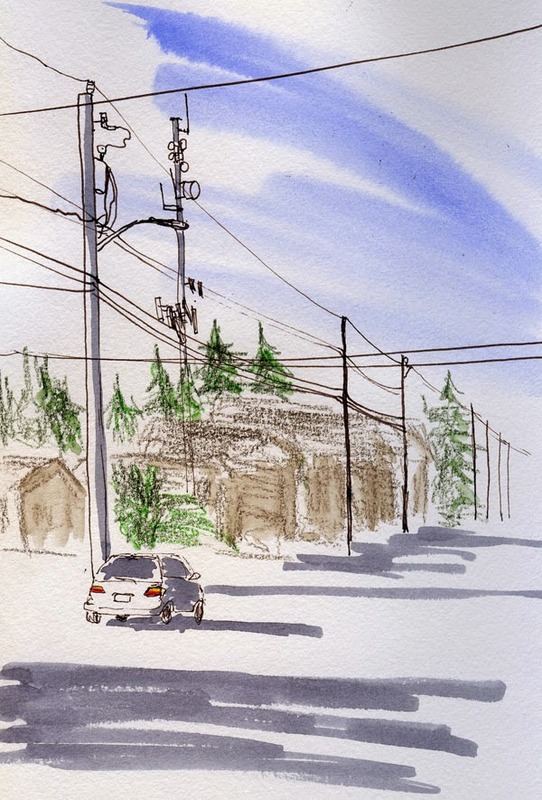 Or just stay here in Seattle but be able to sketch outdoors every day of the year. Imagine the possibilities! Of course, I’d have to figure out how to shelter my sketchbook from the rain, but that would be easy compared to the rest. Which sketcher superpower would you choose? P.S. 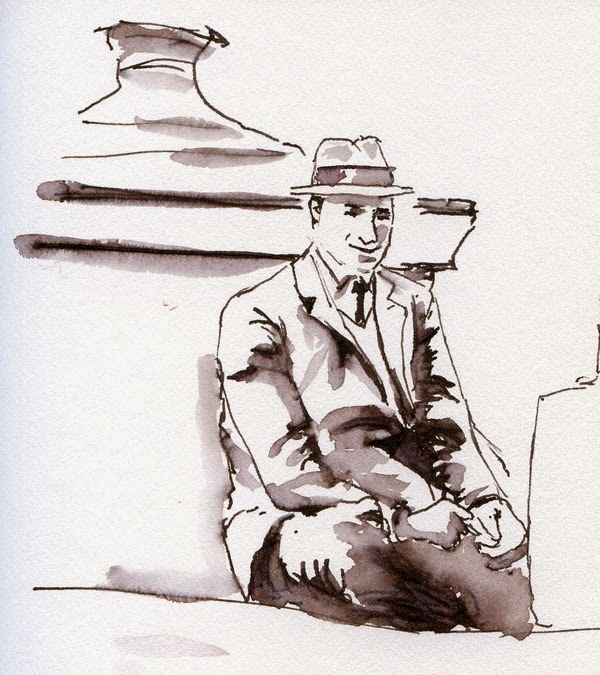 This sketch was inspired by part of a vintage photo I found in a magazine. That lovely color comes from Sailor Jentle Doyou ink, my current favorite brown. Instead I found this one: a relatively tall tree for a traffic circle (those trees tend to be short to avoid being a visual obstruction), with a slim profile and its branches somewhat spindly. Its yellowish leaves made me wonder if it’s an elm, though I’m not sure. 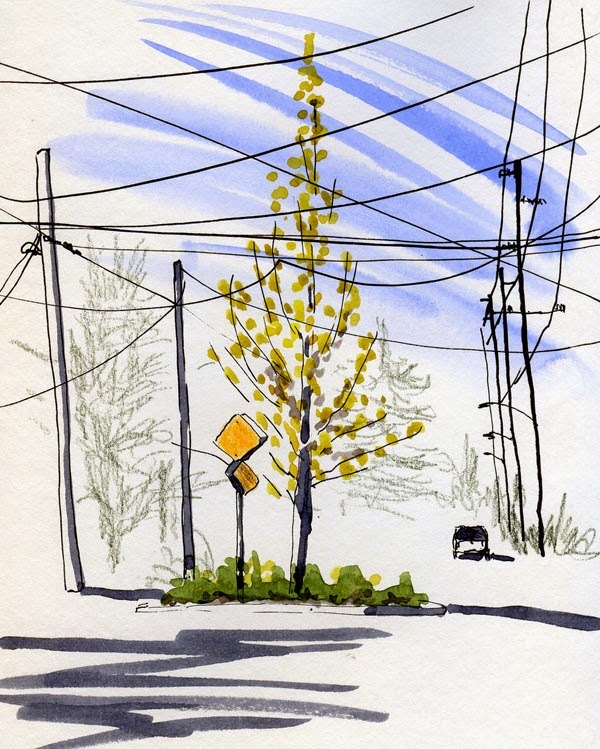 In any case, I was struck by the wild criss-crossing of power lines all around that slender tree, which seems to be growing through the center of a giant game of Cat’s Cradle. Happy Earth Day, skinny tree, and keep ducking those wires! 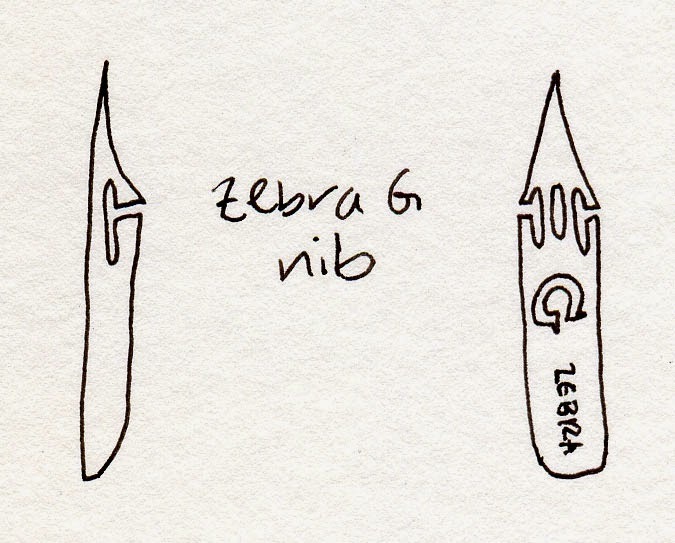 In Part 10 of my Epic Pen Search and Discovery series, I mentioned briefly the Zebra Comic G nib, which was intended to be a Frankenpen but never got off the ground. I tried it on a Jinhao X450 and then a Nemosine, but neither worked. As is, it clearly doesn’t fit properly onto the feed of a No. 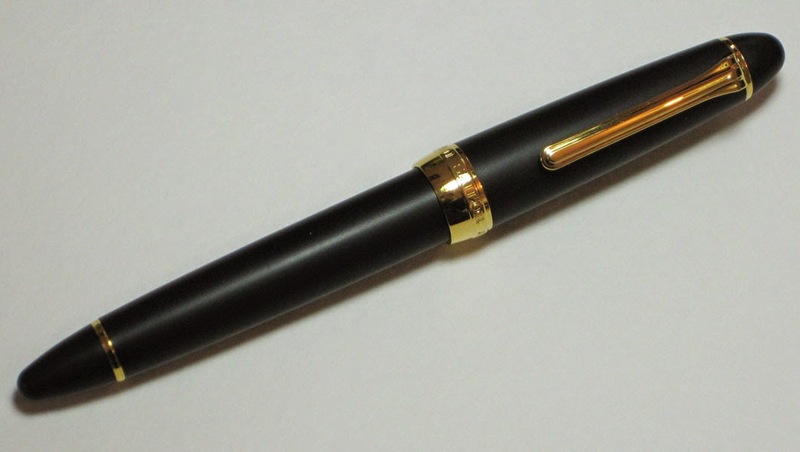 6 nib fountain pen as had been heavily rumored in the blogosphere. 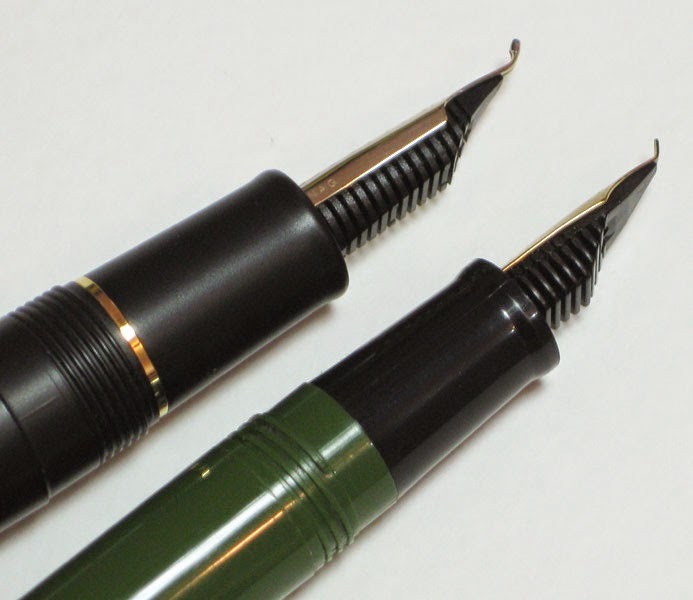 With more investigation, it turned out that the people who had gotten their G nibs to work with fountain pens had done substantial modification to the feeds. At that point I lost interest. When flexed, the G puts out a wide range of line variation. 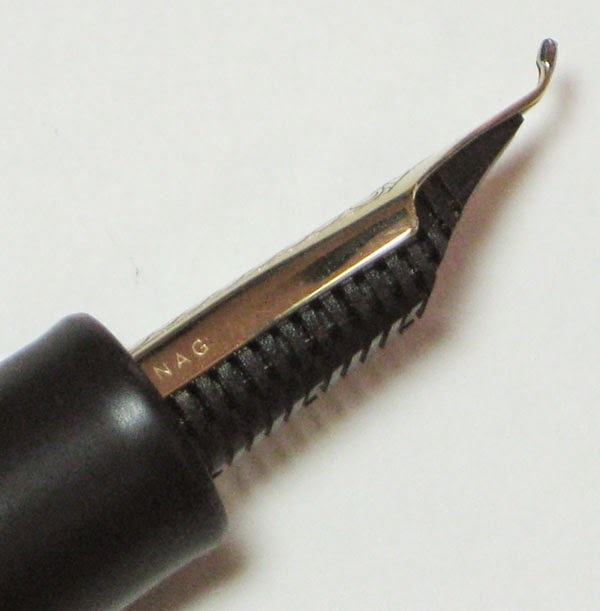 It does railroad quickly if pushed too hard, but I find the chrome nib to have enough spring that the flex is relatively easy to control – easier than the Falcon, in fact. It’s also springier than the nibs of equivalent size in my Speedball set. 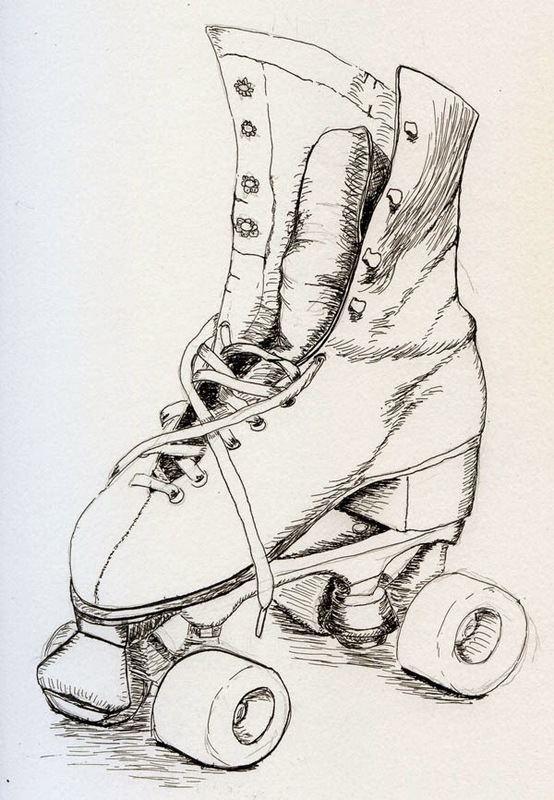 Compared to copying masters from photos, sketching the rollerskate from life was much more challenging – and also that much more fun. 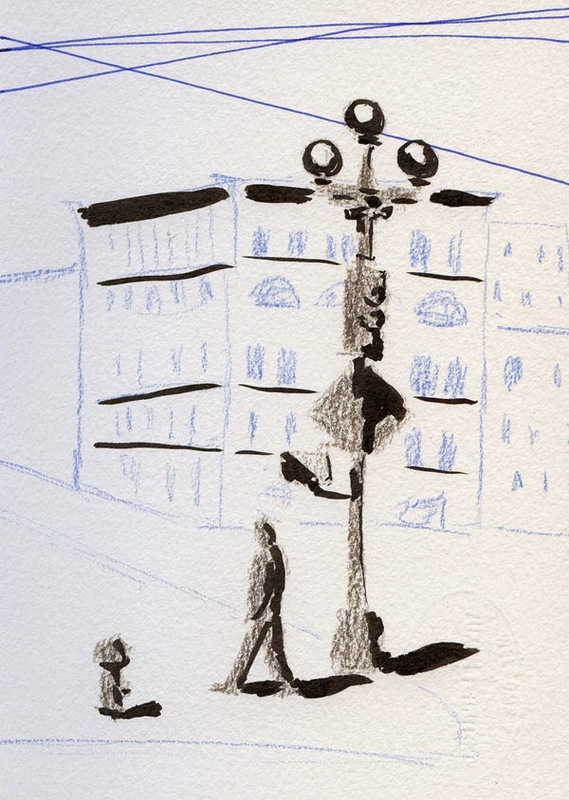 Imagine using that Zebra Comic G for urban sketching! But for that, it’s got to be on a fountain pen. You guessed it: I’m on a mission. 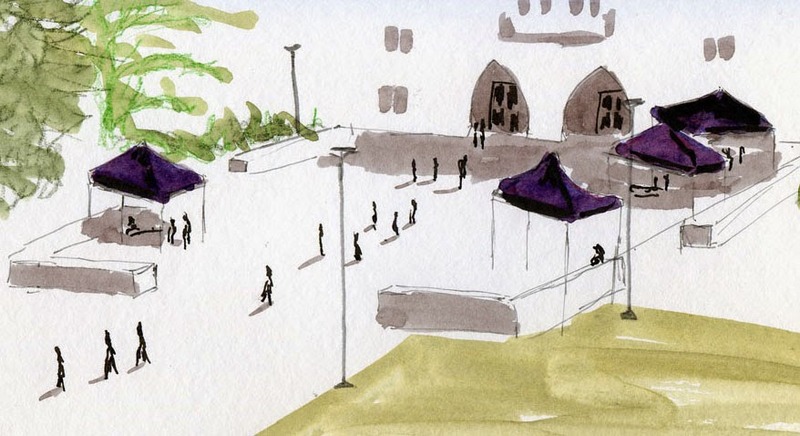 Exactly a month ago on the first day of spring, I sketched at the University of Washington Quad, which was a glorious field of pink blossoms – in the air and on the ground. On Saturday during the Burke sketch event, I have to admit: I kept looking out the windows at the sunny day, itchin’ to get outdoors. After it ended at 2 p.m., I made a beeline to the Quad. Those huge old cherry trees had given up their pink petals weeks ago, but I didn’t mind. Dressed in their late spring and summer greens, they are just as grand. 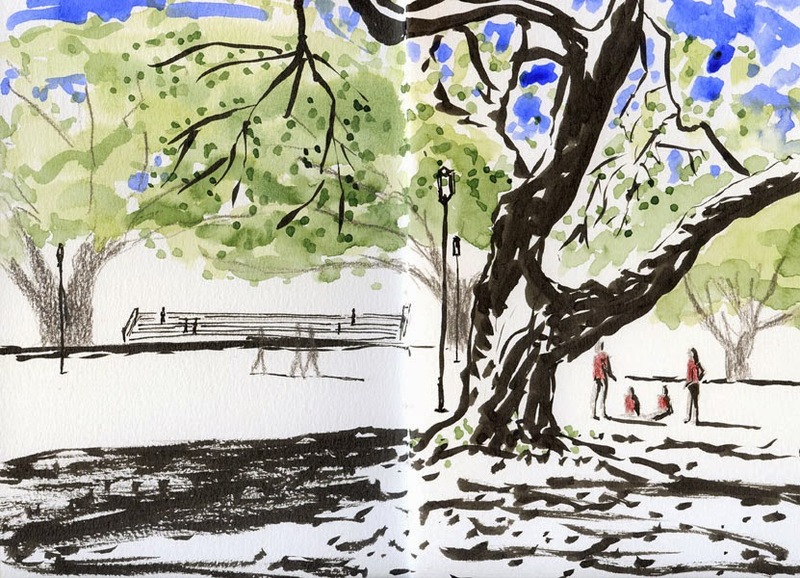 At today’s Urban Sketchers outing, Gabi and I were chatting about the unbelievably beautiful weather – 65 degrees with a clear, blue sky – and how today’s event should be deemed “opening day” of outdoor sketching season! The Seattle Chinese Garden in West Seattle was, indeed, an apt location for our opening day – a gem of serene, open landscaping with a traditional Chinese courtyard and pavilion at its center. I wandered around for quite a while trying to focus on a composition I could manage. With all the lovely plantings and peonies in bloom (though past their prime now), we had a lot to choose from, and I knew I had to select carefully or I’d end up overwhelmed. The stone carp, a Dragon Seeker, grabbed my (and many other sketchers’) attention. 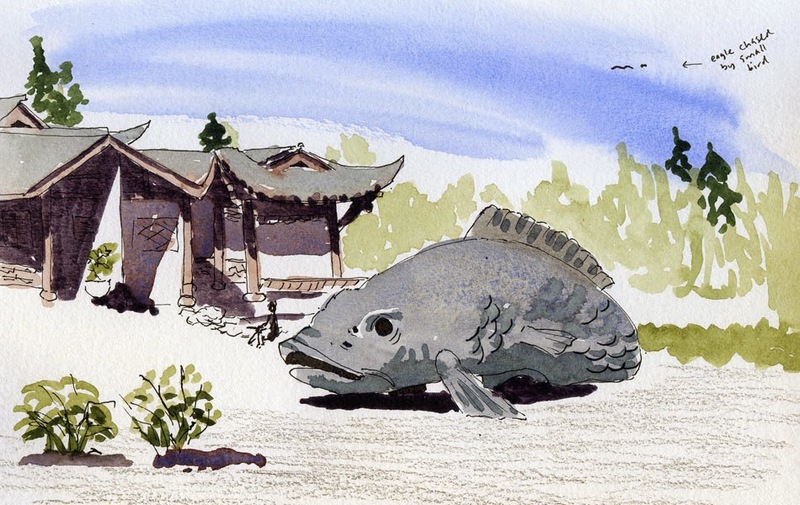 According to a traditional Chinese tale, said the placard, “a carp that could leap the high falls of the Yellow River. . . would be transformed into a dragon.” This carp, which was donated by a Seattle couple, was made in Thailand more than 100 years ago. The main pavilion is in the background (my composition judiciously cropped off most of it so that I wouldn’t get bogged down by the architecture and all those tiles!). Halfway through my sketch, I paused to watch the drama of a tiny bird that chased a bald eagle out of its territory! I spotted the eagle several times throughout the morning. After enjoying the garden a bit more, I settled on a wider view of the stones, trees and bamboo plantings (as well as a couple of sketchers) surrounding a smaller pavilion. By the way, have you heard about Sketch Out/Loud? 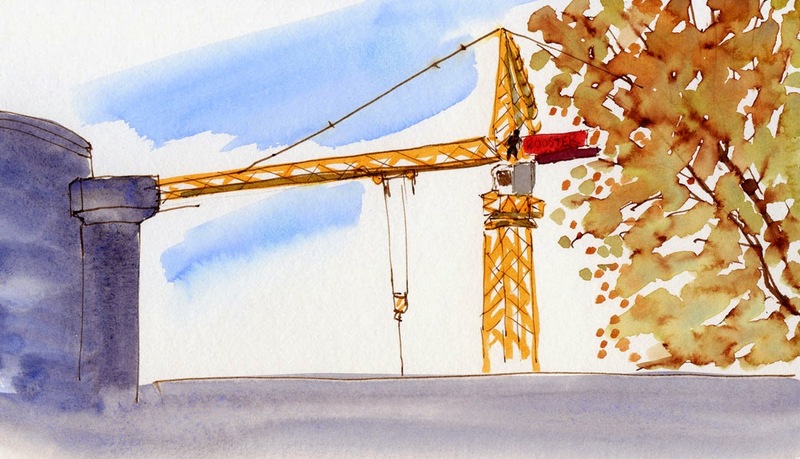 It’s an initiative by urban sketcher and landscape architect Richard Alomar. 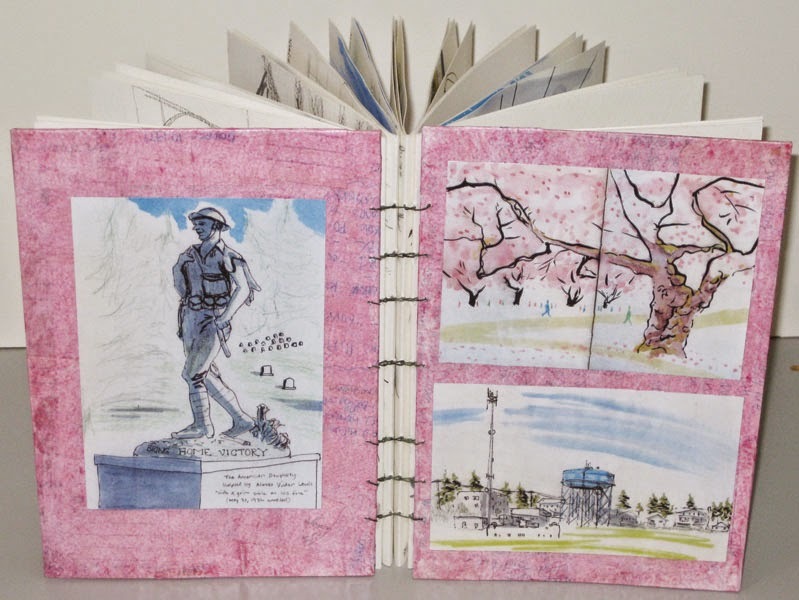 Working with the American Society of Landscape Architects and Urban Sketchers, Richard is promoting Sketch Out/Loud in April as part of World Landscape Architecture Month to encourage urban sketching among landscape architects, architects and designers worldwide. 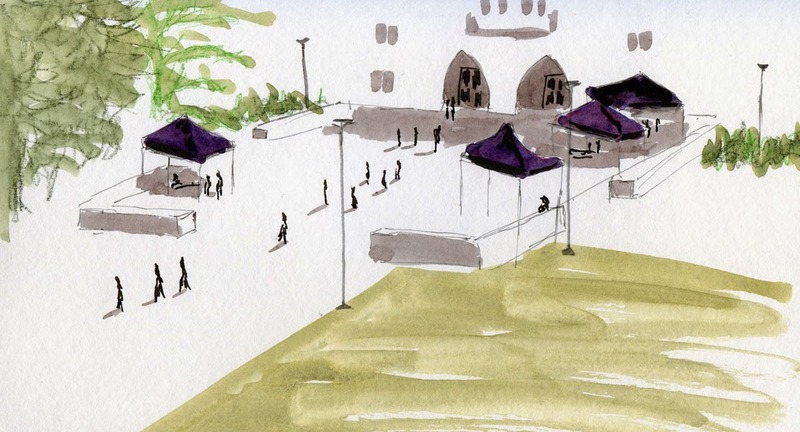 If you sketch parks, plazas, streets, front yards and other examples of landscaping this month, post your sketches with the hashtag #skol2015. 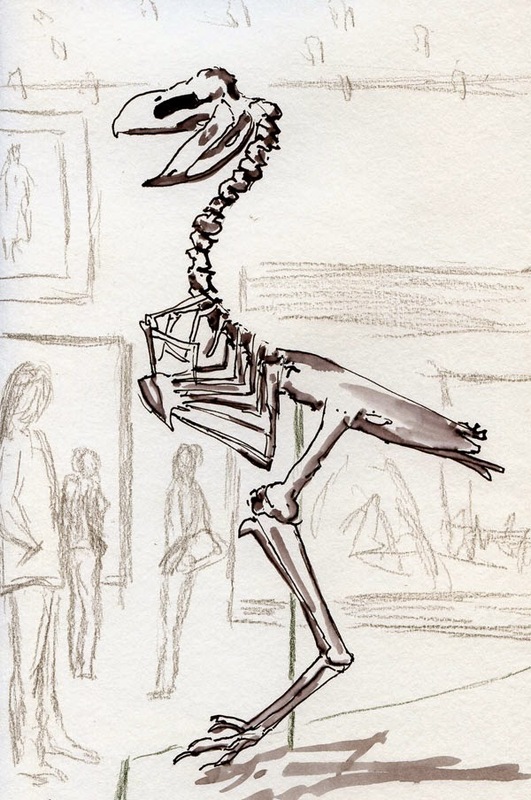 Urban Sketchers Seattle enjoyed sketching at the Burke Museum so much in March that we went back for more. 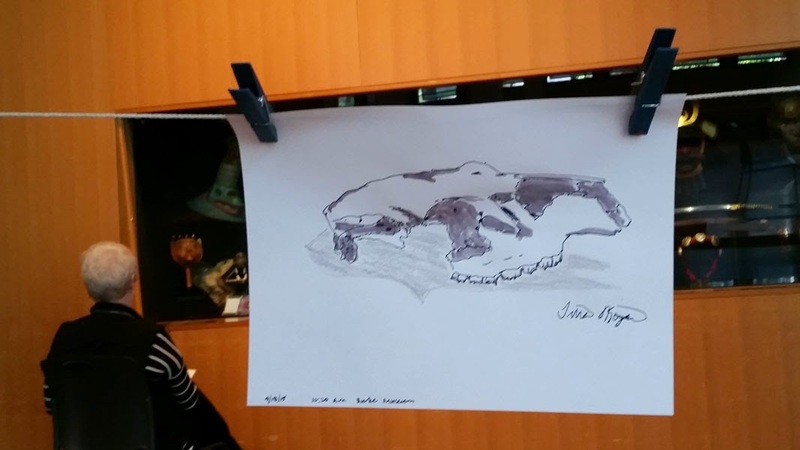 This time we were invited by the Burke to create an event that would encourage other visitors to sketch at the museum, too. 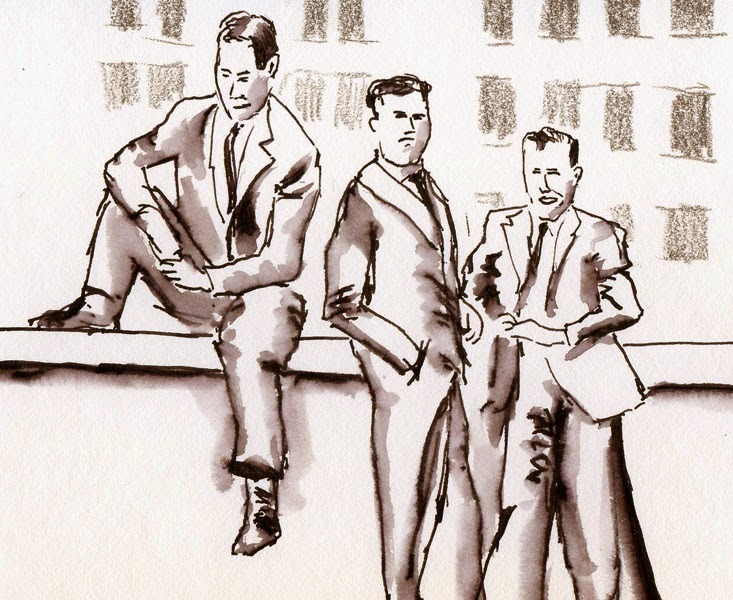 The Burke provided sketching materials and a clothespin line where participants could hang their work. It was tough competing with 65 degrees and sunshine outside, but the museum managed to entice a few visitors indoors. My weather app said it was 64 degrees in the South Lake Union area this afternoon, and the blue sky and sunshine certainly seemed to concur, but the strong wind made it feel much colder. 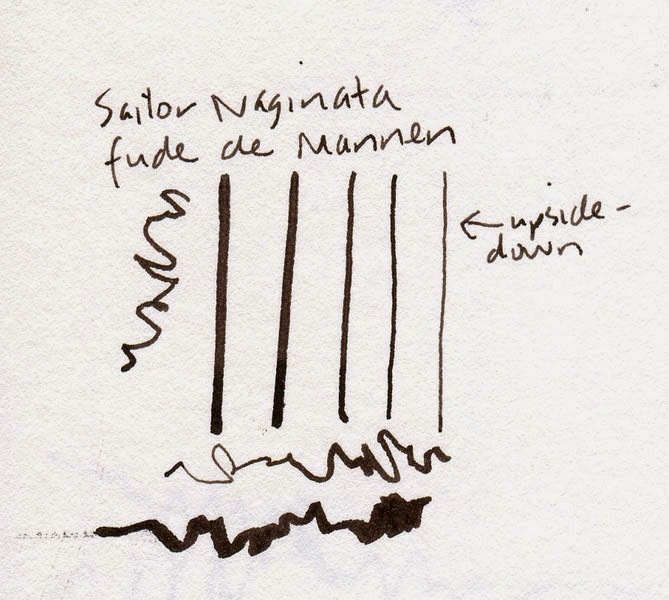 I was hoping to sketch the lake from the park near MOHAI, but it was just too windy for me. 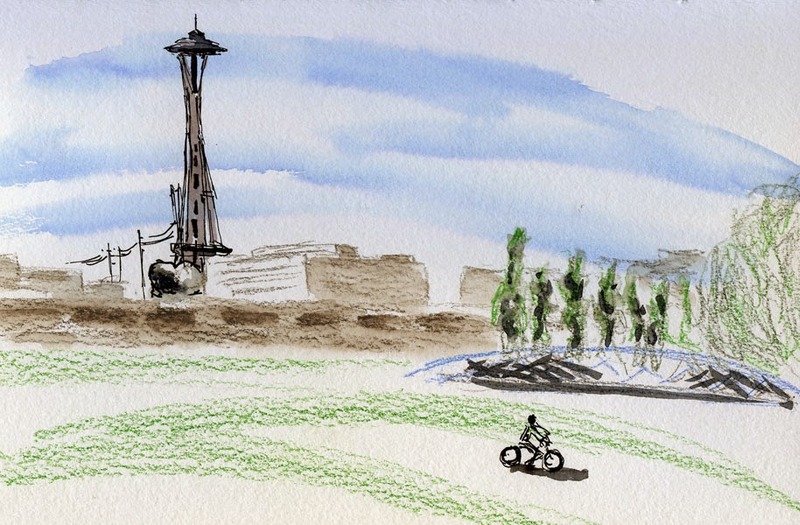 I ducked into MOHAI’s café and sketched the park and the shady side of the Space Needle through the café windows. It’s a less-detailed version of the sketch I made more than a year ago. My March sketchbook is done! My March sketchbook is full and bound. I rarely choose pink for the covers, but since I couldn’t resist putting one of my cherry blossom sketches on the front, it was a rare opportunity to indulge. Also on the front cover is a sketch of Maple Leaf Park when the temperature hit 70 a few weeks ago. On the back cover is the doughboy memorial at Evergreen Washelli cemetery. 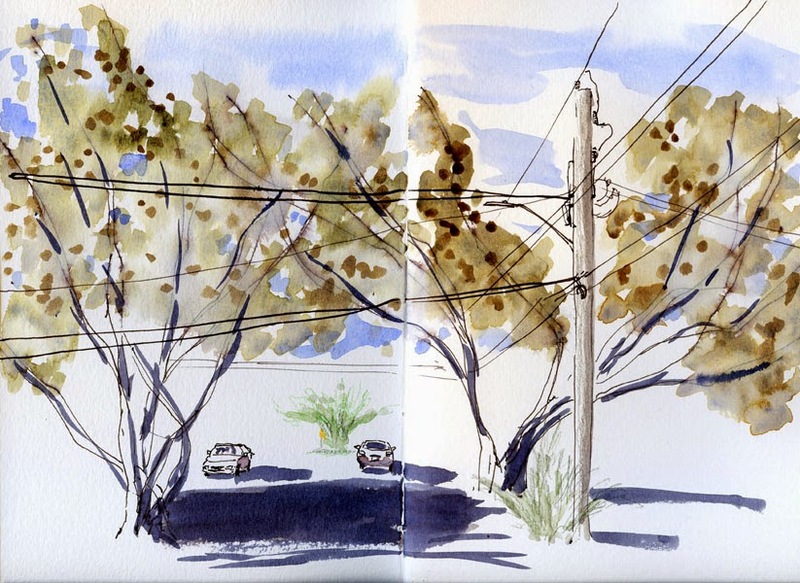 The theme is clear: I’m sketching outdoors again; it must be spring! 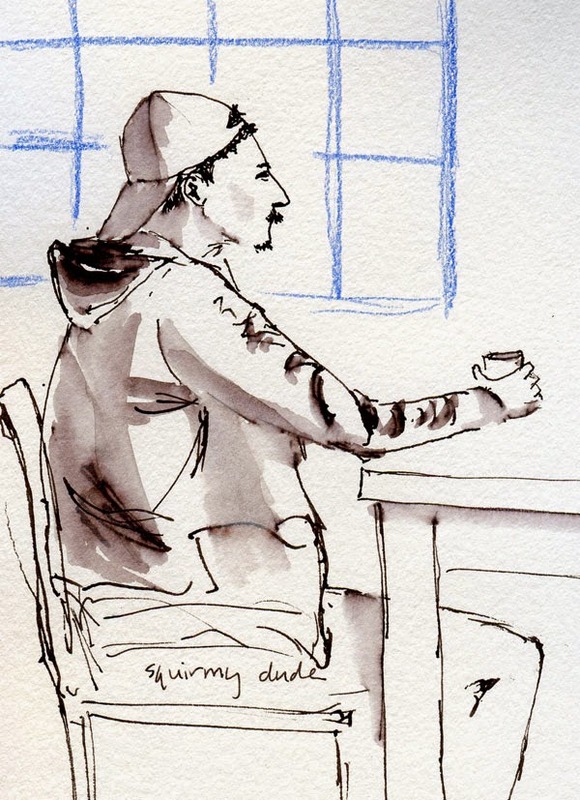 After seeing a gallery exhibit in Pioneer Square this afternoon, Greg and I stopped for a break at Zeitgeist Coffee. We sat looking out the windows that face Jackson Street, where I wasn’t particularly inspired by my view. I do, however, like the old, three-globed lamp posts all around Pioneer Square, one of which was standing right across the street. With colored pencils and a brush pen, I decided to do a simple value study on this lovely sunny day. 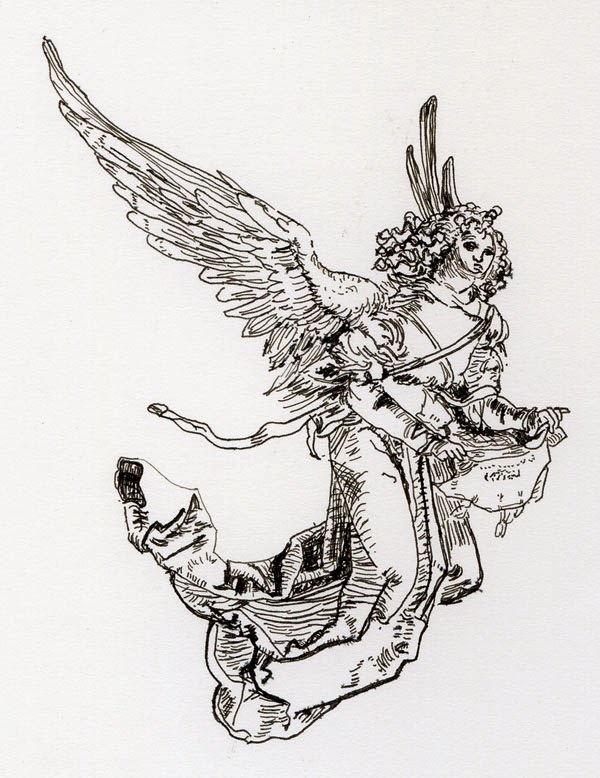 I apologize in advance if this seems disrespectful of an icon intended to comfort the grieving, but the whole time I was sketching the angel statue, I kept wondering if she had been designed in the ‘70s: It’s that flipped-back Farah Fawcett hairdo. Back then, I spent a lot of time in front of the mirror with a curling iron trying to get my hair to do that, so I’m very familiar with the look. Still chilly in the shade, Evergreen Washelli Memorial Park (where I’ve recently sketched a couple times) was quiet. 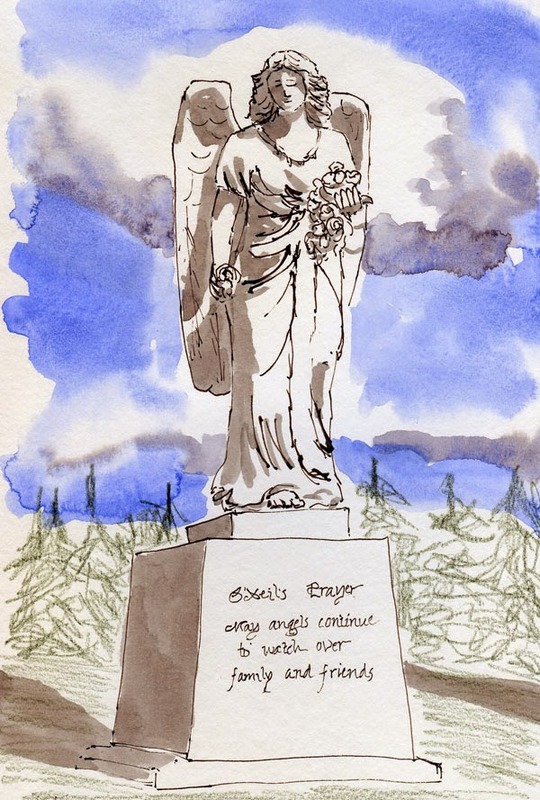 With my back to the sun, bright sky above, and huge, fluffy, white clouds slowly drifting behind the angel, it felt like a sketcher’s heaven, indeed. P.S. Below is the scene I’d really like to sketch someday, but I’m confounded by it. How do I indicate all those white grave markers without drawing or painting every one of them? And the pattern of those parallel rows on a slight incline . . . whew. I’m exhausted just thinking about it. But someday. 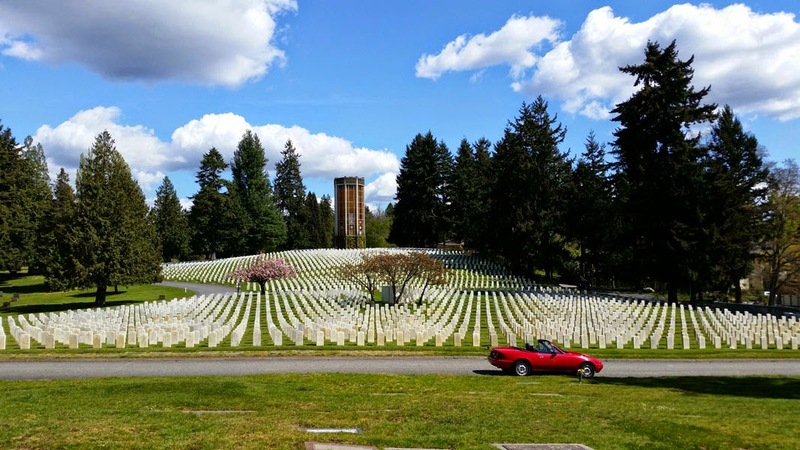 Yes, MiataGrrl took the top down! This is as far as I got on yesterday’s ink drawing class assignment. 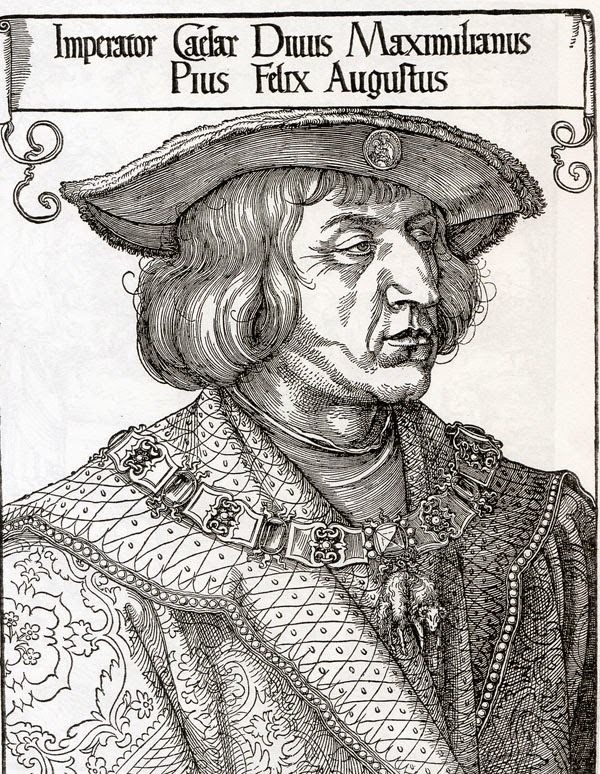 The image I was copying (below) is actually a woodcut print, not a drawing – which makes all those lines even more amazing. As before, I really started getting into a meditative state making lots and lots of tiny hatched lines. At one point, the dip pen nib (or quill) I was using seemed too wide for the wood cut lines, so I switched to an even finer quill. That’s about the time my neck got sore, and I had to take a break! Speaking of which, I see lots of blue sky and fluffy white clouds out there today – a nice break from our recent run of gray and rain. Time for some outdoor sketching!